Colts Neck High School opened in the fall of 1998 with just sophomore and freshmen classes. Since then we have competed in fourteen states (NH, MA, RI, CT, NY, NJ, PA, DE, MD, VA, NC, IN, OR, and CA). click for stories Ashley Higginson NTN champion 2006. Distance Medley Relay 2005, Craig Forys 2 mile 2007; Girls 4 x 1 mile Relay 2006 & 2007, Ashley Higginson 2 mile 2007. Ashley Higginson 2 mile 2007. Meet of Champion winners (16, 1 team) click for stories Craig Forys 2005, 2006; Girls Team 2006. Craig Forys 1600m/3200m 2006, 3200m 2007; Jordan Brannan 3200 2016, 2017; Ashley Higginson 3200m 2005, 2006, 2007. Craig Forys 1600m 2005, 3200m 2006, 1600/3200 2007; Ashley Higginson 3200m 2007, Allison Linnell 1600m 2008. Craig Forys 2005, 2006; Briana Jackucewicz 2005. Boys Team 2016; Girls Team 2000, 2005, 2006, 2016, 2017, 2018. Jorge Ventura 1600m 2001, Dave Gaines 800m 2003, 4 x 800m Relay 2003, Distance Medley Relay 2006, Craig Forys 1600m/3200m 2006, 1600m/3200m 2007, Mark Leininger 3200m 2009, Jordan Brannan 3200m 2016, 2017, Ryan Tompkins high jump 2016, 2017, Boys Team 2016, 2017; Pole Vault Relay 2005, High Jump Relay 2005, Ashley Higginson 3200m 2005, 2007, Distance Medley Relay 2006, 4 x 800m Relay 2007, Allison Linnell 3200m 2008, Briana Jackucewicz 3200m 2009, 4 x 800m Relay 2018. Jorge Ventura 1600m 2000, 2001; Ryan Jagielski 800m 2005; Craig Forys 1600/3200 2005, 1600/3200 2006, 1600/3200 2007; Ashley Higginson 3200m 2005, 2006, 2007; 4 x 800m Relay2018. State Record Holders Craig Forys Van Cortland Park 2.5* mile & 3.1 mile course 2006, Holmdel Park 3.1 mile course 2006*. Ashley Higginson 3000m, 2 mile 2007, Briana Jackucewiz 5000m 2007*, 4 x 1 mile relay 2007*. Boys 4 x 800 relay 2005*, Craig Forys 3000m*, 3200m*, 2 mile 2007*; Ashley Higginson 2 mile*, 5000m, 2000m steeplechase 2007. State Class Record Holders Craig Forys frosh Holmdel Park 2003, senior Holmdel Park*, Van Cortland Park 2.5 mile* & 3.1 mile course 2006; Briana Jackucewicz frosh Holmdel Park* 2005. Craig Forys frosh 1 mile & 3200m 2004, junior 1 mile, 3000m & 2 mile 2006; Ashley Higginson frosh 1 mile* 2004, senior 3000m & 2 mile 2007; Briana Jackucewicz frosh 1600m* & 3200m 2006, junior 2 mile 2008*. Craig Forys soph 1600* & 3000 2005, junior 1500, 3000* & 3200* 2006, senior 3000, 3200 & 2 mile 2007; Ashley Higginson senior 2 mile, 5000 & 2000m steeplechase 2007. National Ranking Girls Team - 4th in NTN Nationals 2006, ranked 17th US 2005. Craig Forys - national freshman 2 mile record 2004* Boys Team - Dyestat Web Nationals Northeast Regional Champs 2007. 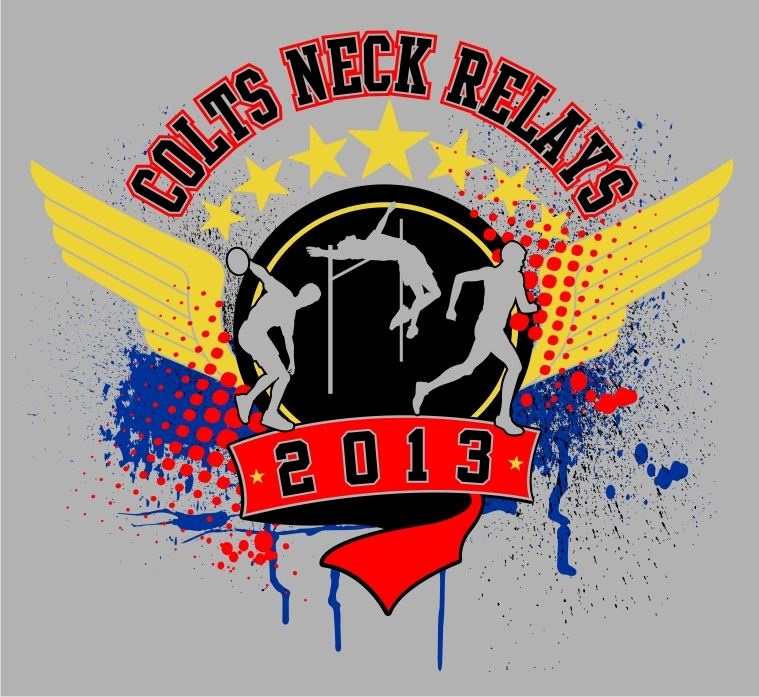 Follow the team on twitter at CNHS_XC_Track or click the twitter logo on left. This is the new twitter address. Mark Leininger '09, qualified for the 2020 Olympic Marathon Trials by running 2:17:51 in the California International Marathon 12/2/18. He ran under the 2:19:00 qualifying standard. *** Outdoors: Colts Neck alum, Jordan Brannan '17 (Iona) ran 29:43 (10,000), Anthony Russo '17 (U Penn) 29:44 (10,000) and Matt Schaefer '18 (Northeastern) 31:30 (10,000), all at the Raleigh Relays in NC. Ryan Thompkins '17 (Villanova) has jumped 6' 07" and Liam Hoagland '18 (Middlebury) has run 1:58 for 800 and 4:00 for 1500. Sept 28, 2019, featuring 1.2 miles through the Animal Safari and discounted admission ticket to Six Flags Great Adventure Park. The Freehold-based racing team for elite women's distance runners. To contact this website or Coach Schlentz, send an email to jschlentz@frhsd.com. Other coaches, Joe Lykes at jlykes@yahoo.com; Kevin Hein at khein@frhsd.com and Dennis Bruck at dbruck@frhsd.com. Click the coach's name to see high school pictures. This website is a private effort and is not directly associated with the Freehold High School District and Colts Neck High School. The pictures on this website are copyrighted and should not be used in any public manner without the webmaster's approval.